Are the tops of Beets Edible? Until recently I did not know that beet greens were edible. During her last visit here my mother-in-law only mentioned it and cooked it for us. I don’t know why I hadn’t googled earlier to find more about these greens. Better late than never, right? I found out that Beet greens contain a large amount of vitamins A and K and anti-oxidants Beta Carotene and Lutein. For more detailed information about the nutrient value click here. My mother-in-law mentioned that the stems are not edible, so she used only the leaves. But later I searched in the net and found that the stems are edible, healthy and tasty too. Check it out here. 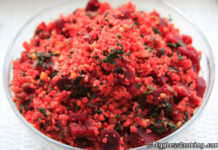 This Beet Greens Kootu is like preparing any other greens/vegetable kootu. 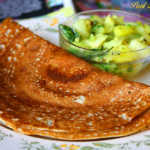 It’s very simple to prepare and goes well with both rice and chapatis. 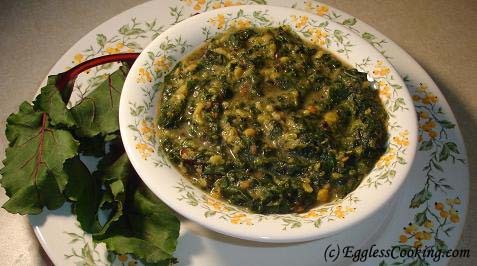 Enjoy this simple and delicious Indian Daal recipe using beet greens. Simply tear the leaves and rinse it thoroughly. We did not use the stems this time, because we did not know that it was edible. 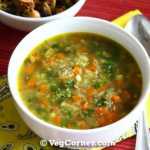 The daal and greens can be either pressure cooked together adding enough water for 1 whistle or it can be cooked in a vessel directly on stove top itself, if you are using moong daal. In case you choose to go with the latter method, first add the daal, turmeric powder, hing and enough water in a vessel and don’t close it with a lid. If you close the vessel with the lid, the water will start overflowing while boiling and you will have to spend the next 5 minutes cleaning the range. Once the daal is half cooked add the cleaned greens and cook it tender adding water as required. Once both the daal and greens are cooked add enough salt. While the daal and greens are cooking add all the ingredients mentioned for grinding in a blender and grind it to a fine paste using milk/water. Add this paste to the cooked greens and let it boil for another couple of minutes, while you prepare the tadka. In a small frying pan add oil and after it heats add the remaining ingredients and fry until the daals turn golden brown and add it to the greens and remove it from heat. I have mentioned to grind the ingredients with milk because, while cooking any greens adding a very small quantity of milk will enhance the flavor of the greens. This is my mother’s tip. So you can either grind using milk or first grind it with water and after adding the paste to the cooked greens add some milk and let it boil for another 3-4 minutes. Another tip, while grinding for any kootu/daal using a combination of red chillies and green chilies gives a better taste than using either one of them alone. Find some more beet greens recipes here. While grinding the ingredients for the daal, you can also use coconut milk powder instead of coconut. 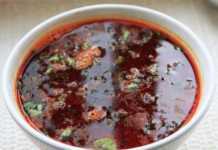 It gives an excellent taste to the daal. Similarly if you don’t have coconut at home, you can also use carrots instead. This works in any kootu/daal recipe and also in mor-kuzhambu (but you will have an orange color kuzhambu). The end product tastes as good as using coconut itself. This was my mother’s discovery. Back in South India, there is a practice that they don’t want you to eat coconut for atleast 2-3 months after delivering a baby, especially if you are breast feeding. The elders say that it will create digestive problems in the newborn. So my mother experimented using carrots instead of coconuts in daals and other stuff and it came out very well also. Even yesterday I didn’t have enough coconut for grinding chutney, so I used half a carrot. But you will have to increase the quantity of chillies to offset the sweetness of the carrots. The chutney had a light orange color, but no difference it taste whatsoever. Spring onions/scallions daal can also be prepared in the same way as above. 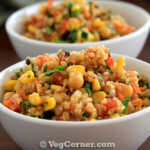 This is one of my favorite side dish for chapathis. This is my grandmother’s recipe, which I had mentioned in my tribute to her. Of course beet tops are edible. 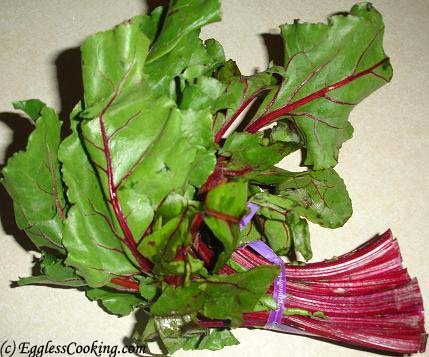 They are closely related to Swiss Chard (just compare pictures of the leaves) which is highly nutritious. 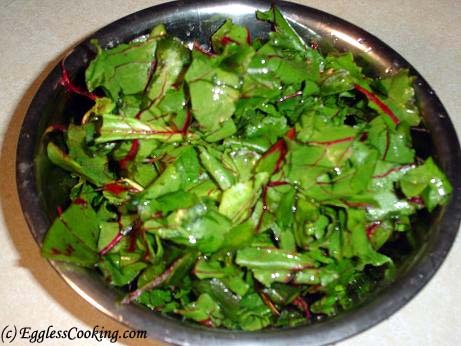 Sometimes Swiss Chard is “deboned,” prepared without the stems and thick ribs that your beet leaves have in the picture above. Of course, the ribs and stems are edible too, as you point out. 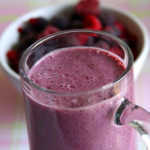 Hey Madhu- Great Idea, I tried beet greens and it was a super hit with my in-laws. Thanks for trying it Shobi. After buying beets, i was looking for a way to not to throw away those beautiful leaves. And Google lead me to this recipe! I just prepared it (ore something based on your recipe) and ate it. It was wonderful! 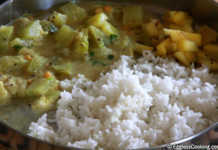 While eating i remembered that mom just to make me this vegetable dish when i was a child. I just called her to apologize that i didn’t ask her, but instead looked for a recipe on the internet. 😉 But anyway: Thank you! You’re welcome Jasmin. The same method can be used to prepare all greens. I was reading some of the recipes where you mention that you substitute coconut with grated carrot. I use grated carrot only for kosumalli or any vegetable curry that may require sprinkling of grated coconut finally. For aviyal, koottus, etc, try using walnuts instead, where they taste excellent. People with heart disease are usually advised a diet rich in walnuts. They are an excellent source of omega-3 fatty acids. Just make sure that you do not toast them before using. Thanks for the tip Ranjani. I will try walnuts instead of coconut the next time. Madhu, WHat is coconut milk powder? It’s coconut milk in powder form Deepa. You can get it in Indian grocery stores. I have used Maggi brand.